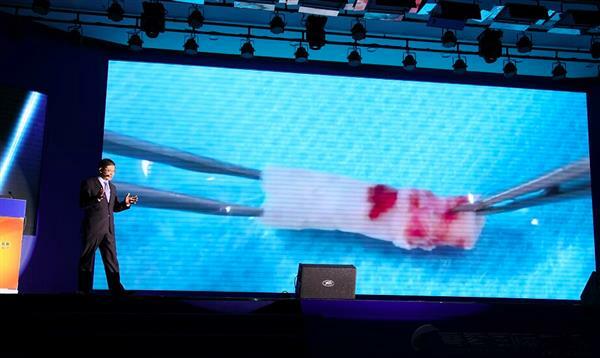 Scientists at Sichuan Revotek and the Regenerative Medicine Research Center of West China Hospital at Sichuan University have successfully embedded 3D-printed blood vessels into simian test subjects. The vessels, which are made of stem cell-based organic material, were a major breakthrough in vascular regeneration. According to 3Ders the system uses “stem cell bioink, which was prepared from the autologous adipose mesenchymal stem cells (ADSCs) of the monkeys.” Essentially the material came from the monkeys themselves and were not subject to organ rejection. The process involves creating a 3D-printed scaffold of biological material that grafts to natural blood vessels and are virtually indistinguishable from the monkey’s natural organs. This means that real, usable organs and be printed and implanted in a few hours with minimum invasiveness. You can check out another fairly gory video here or watch a short animation below.